From lightweight to heavy duty, available in 3 standard footprints,our foldable large containers have been especially developed for long distances and a large number of return trips, maximizing cost saving and lowering carbon footprint. Hygienic, strong and stable, our Big Box and Geobox ranges offer a robust storage and shipping sustainable packaging system . Our Rigid Pallet Containers are ideal for heavy-duty distribution applications and are automation-friendly. They improve space efficiency and optimize truck load. Schoeller Allibert offers a wide range of plastic pallets. Our pallets are available in 8 standard footprints and 5 different types to meet all logistics requirements: display, light, medium, heavy and clean room models. 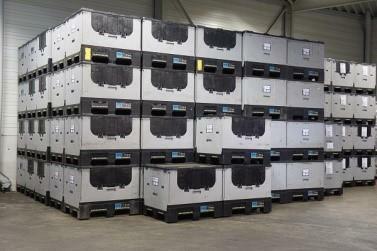 Durability, profitablity, hygiene, safety are our pallet's main benefits. COMBOLIFE foldable IBC: for food, pharmaceutical and non hazardous chemicals liquids and fluids handling and transport, our Foldable IBC provide 100% hygiene and safety .Thank to it's unique folding ratio, our IBC offers maximum cost savings on return trips and reduce the environmenal impact compared to one ay or rigid IBC altenatives. Our versatile Foldable Small Containers (FSCs) are used in a wide range of industries and applications.From food retail supply chain to automotive parts disribution.Standard in their footprints and providing space saving up to 85% ,FSC's are the most profitable and environment friendly reusable logistics packaging. Stackable containers are suitable for a variety of industries and offer efficient handling, storage and transport. Thanks to many different footprints, heights and variants in bases and walls they meet all kinds industries needs. Small, versatile and easy to handle, they are the perfect solution for automated handling systems. Stack/Nest containers securely stack when loaded and nest when empty to save valuable space on return transport. Ranges include award-winning Maxinest produce trays, tamper-evident Integra ALCs (Attached Lid Containers) and bicolour 180º's for easy visual identification of stack / nest position. Our dollies facilitate safe and easy moves of crate stacks. Standard or specific footprints, their decks design allow most plastic containers nd cadboard boxes to be held stable .Wheels are available in different materials to meet end uses requirements .Linkable models are perfect for retail and order preparation applications. Whether for beer, mineral and healing water, soft drinks, fruit juice or mixed drinks, we certainly have the right beverage solution for your brand. And if you have any special requests, we will help you to develop them. Your sales and marketing will benefit from this. In fact, thanks to a good packaging solution, with our design and system expertise, you will be able to stand out in your market. The comprehensive range of ROPAC pails is UN certified for hazardous solids and liquid goods, for all types of transport modes.